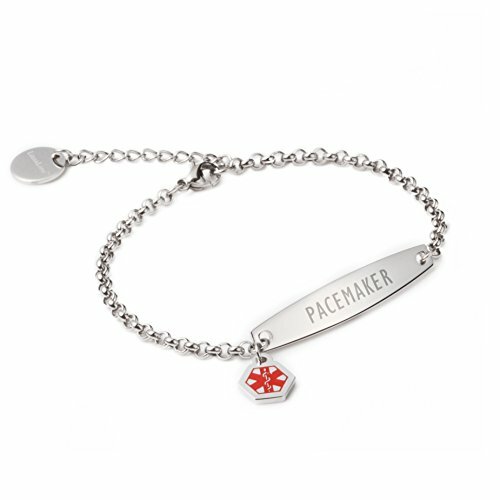 linnalove-Pre-Engraved Simple Rolo Chain Medical id Bracelet for Women & Girl-PACEMAKER by linnalove at Lamont Design. MPN: MD1354-PACEMAKER. Hurry! Limited time offer. Offer valid only while supplies last. We launch this beautiful stainless steel Rolo medical id bracelet, designed for women and teenagers. The exquisite design is a very cute bracelet! We launch this beautiful stainless steel Rolo medical id bracelet, designed for women and teenagers. The exquisite design is a very cute bracelet! Completely waterproof can wear his movement: running, swimming and so on. Debossed medical alert Star of Life symbol recognized by medical responders. Extreme durability! PACKING: It comes with a free Medical alert id wallet and grey velvet bag and white gift box that printed with" LinnaLove". Perfect for gift. If you have any questions about this product by linnalove, contact us by completing and submitting the form below. If you are looking for a specif part number, please include it with your message.